Bob Dylan Won't Be Picking Up His Nobel Prize In Person : The Two-Way The musician won the 2016 Nobel Prize for literature. He told the committee in charge of the award ceremony that he had "pre-existing commitments" and was unable to accept the prize in person. 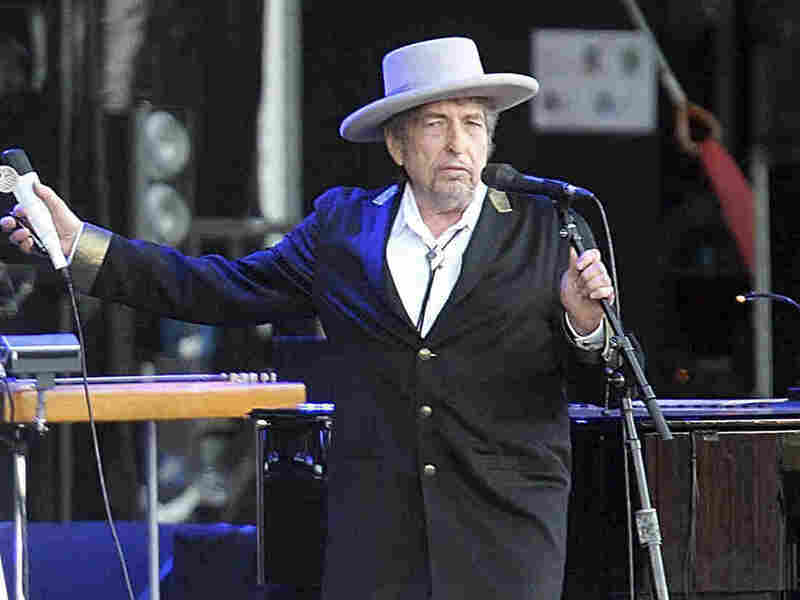 Bob Dylan, seen performing in 2012, told the Swedish Academy that he had "pre-existing commitments." Bob Dylan says he will not travel to Stockholm to pick up the 2016 Nobel Prize for literature. "He told a reporter he would try to attend if at all possible, [but] now he says he cannot accept the award in person at the December ceremony in Stockholm. "In a statement, the Swedish Academy says it looks forward to Dylan's Nobel lecture sometime in the next six months. The Academy says that's 'the only requirement.' "
The Nobel committee announced on Oct. 13 that Dylan had won this year's prize, saying he "has the status of an icon" and that "his influence on contemporary music is profound, and he is the object of a steady stream of secondary literature." But as Elizabeth notes, Dylan took his time acknowledging the honor. Late in October, the committee still hadn't heard from him (although a line on his website did mention the award) and called him "impolite and arrogant." "That laureates decide not to come is unusual, to be sure, but not exceptional. In the recent past, several laureates have, for various reasons, been unable to come to Stockholm to receive the prize, among them Doris Lessing, Harold Pinter, and Elfriede Jelinek. The prize still belongs to them, just as it belongs to Bob Dylan." The Associated Press reports that Jelinek, the Austrian playwright and novelist, cited a social phobia in declining to attend the prize ceremony in 2004. At least one past Nobel laureate — a winner of the 1973 peace prize — rejected the award outright. Le Duc Tho refused the honor because he was to share it with Henry Kissinger, who he contended "had violated the truce" in Vietnam.